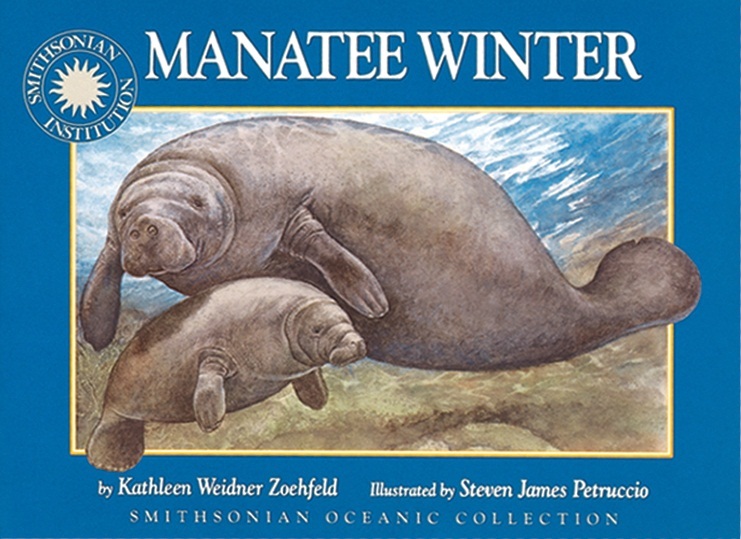 Manatee Winter tells the story of a mother manatee and her calf in late fall taking the journey from the chilly Gulf of Mexico to warmer waters of a spring fed river. The journey is long and the water is cold and the mother and calf get tired along the way. There are some scary moments when mother and calf get too close to a boat, and a particularly scary moment in which the calf gets separated from his mother after running away from a boat. But after the long journey, mother and calf make it to the warm spring and find themselves surrounded by manatees. They are happy to have found a home for the winter. 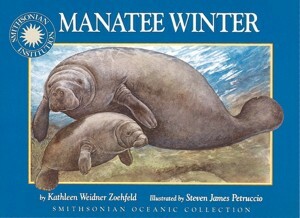 We’ve had this book for a while, but my daughter (2.5) became interested in it after seeing manatees in the wild at a state park in Florida about a month ago. We saw them grouped around a warm spring for the winter just as described in this story. This book has joined our book rotation ever since, sometimes even edging out Winnie the Pooh books, which are her current favorites. In fact, when asked to pick three books to take to Grandma’s for the weekend, she chose two Winnie the Pooh books and this one. Personally, I find the text a bit boring, but I guess it’s just right for a toddler. She particularly likes that it features a baby manatee, because babies in any form delight her. Manatees have always had a special place in my heart since I grew up in Florida. Learning about manatee safety was a large part of my animal science education and I made many a “Save the Manatees” poster for various events in my childhood. I appreciate that this book touches on boat safety from the perspective of a manatee, showing how scary boats might be to them. No manatee is harmed in this book, but my daughter was worried that a manatee was going to be cut by the boat. I appreciate any book that depicts how the human environment may harm the animals. This book may spark discussions about animal awareness and safety. This sounds great, having it edge out Winnie the Pooh is high praise indeed!